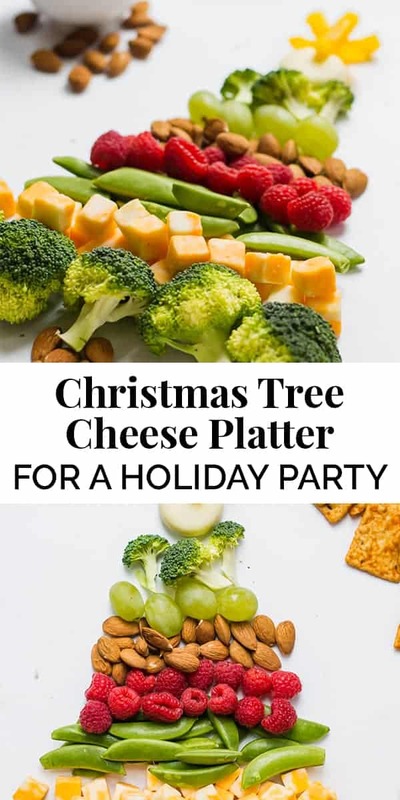 You have to make this Christmas tree cheese platter for a holiday party this year. Whether you’re throwing your own, or bringing something potluck style, this Christmas tree cheese board wins EVERY. TIME. Broccoli and snap peas are a great source of fiber and nutrients. Grapes and raspberries add to the much-needed dose of Vitamin C to help boost immunity, and nuts are excellent for getting those healthy fats to support healthy cell growth. Hummus is ALWAYS my go-to dip for a cheese platter. 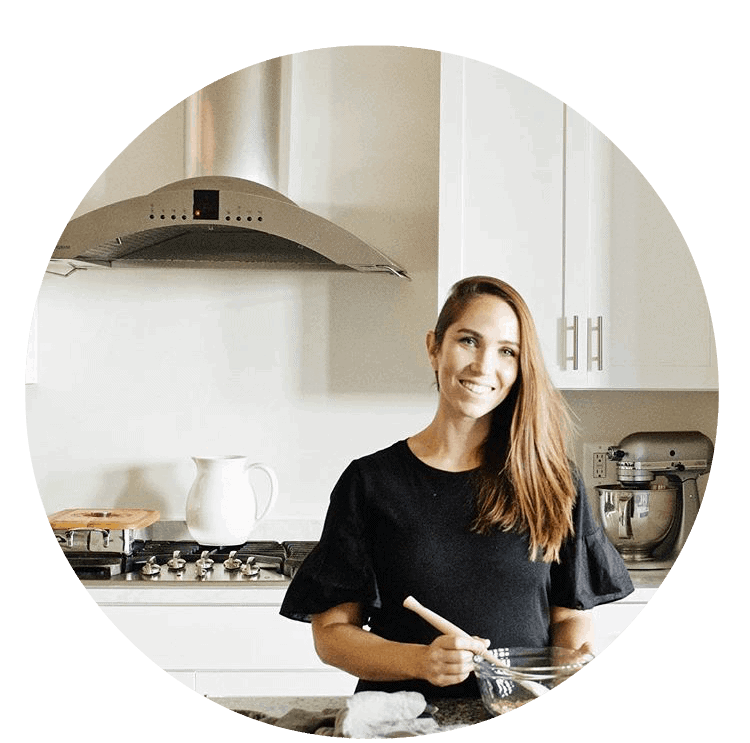 You must make my Instant Pot hummus! It’s suuuuper creamy and smooth, and you will never make homemade hummus any other way. Click here to get the recipe. The key to making a beautiful and colorful presentation is making sure you have a good mix of colors. Since we want to keep it looking festive and Christmas-like, greens and reds are essential. I opt for broccoli, grapes, and snap peas for that vibrant color and varying flavors. However, any other green veggie you like. For the reds, I like raspberries, and cherry tomatoes are also a great option. And you can’t forget the nuts and cheeses! In terms of forming the Christmas tree, always start at the base. It’s also important to consider the textures and balance of color. Feel free to experiment and play with the arrangement! Basically, I have you covered for your Christmas party appetizers! 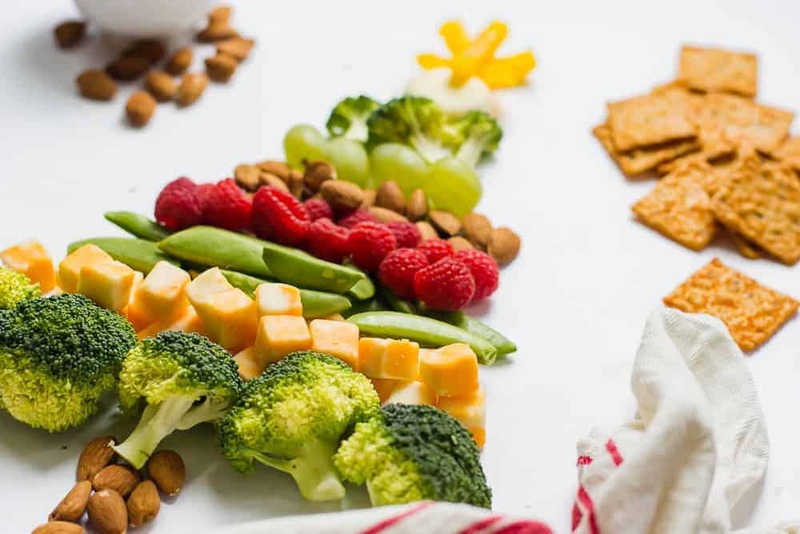 Grab the recipe below for this Christmas tree cheese platter and enjoy! 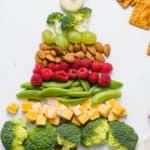 This Christmas tree cheese platter is the a simple and healthy appetizer for a holiday party. Use fruits, veggies, cheeses, and nuts for maximum flavor. 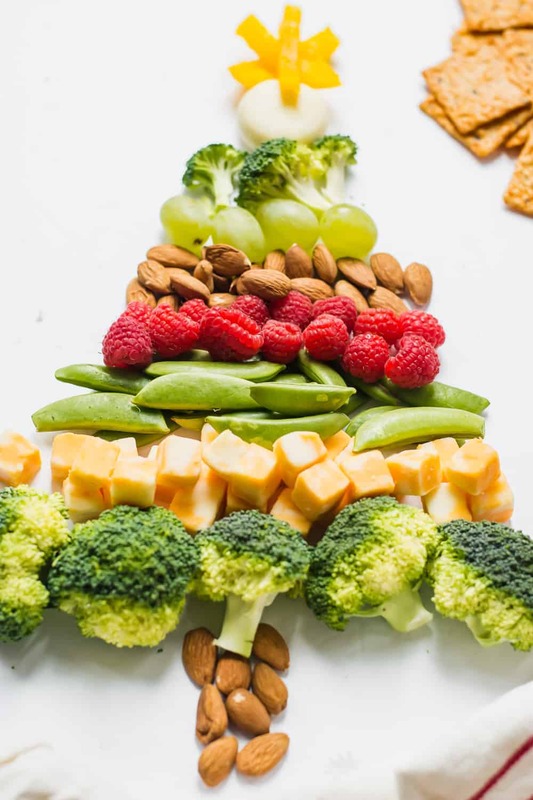 On a large rectangle serving platter or cutting board, start arranging the base of the tree by lining up the broccoli. Arrange the rest of the veggies, fruits, cheese, and nuts in rows. Make sure each row above is more narrow than the last, to make a Christmas tree shape. Arrange foods in the aesthetic color and order you desire. Add 5-6 almonds at the bottom, arranged in a rectangle to make a tree stem. Arrange 5 strips of the yellow bell pepper to make a star at the top. Serve with hummus and gluten free crackers. Enjoy!